Pair of Celestial Maps depicting the Northern and Southern Hemispheres. Der Nordliche Stern.Himmel. Der Sudliche Stern.Himmel. A desirable set of two celestial maps depicting the stars, constellations, and comets of the northern and southern hemispheres. 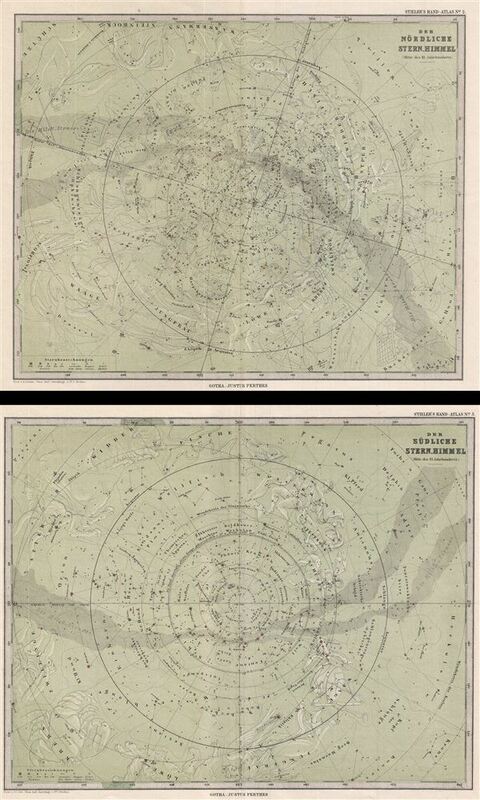 Both maps illustrate the night sky on a blue-green field with the constellations of the Zodiac subtly rendered. Also identifies various star clusters, comets, the Milky Way (Milch Strasse), etc. The size given below is the size for the individual plates. The southern is slightly larger than the northern sheet, though they will still frame together beautifully. engraved by Dr. C. Bruhns and C. Hellfarth and published by Justus Perthes for Adolf Stieler 1875 Hand-Atlas. Stieler, A., Hand-Atlas, (Gotha: Justus Perthes) 1875. Rumsey 2449.001, 2449,002. Phillips (Atlases) 4352.